Buying Designer Sunglasses In Bulk - CTS Wholesale LLC. You need to get a leg up on your competition when you are selling shades, and one of the best ways is to look for the best deals on bulk designer sunglasses. Getting the lowest prices on the most popular brands is crucial, so we have put together a few quick tips to streamline the process and help to increase your profit margin. Your starting point can make all the difference and getting the most information in the quickest easiest way means looking online. The Internet is a great tool to educate you on what the current hot trends are, how much the most popular items cost, and who is willing to supply the best deals on a bulk purchase. Researching all this initial data from the comfort of your own home can't be beat for cost efficiency. Make sure you do what is needed to legitimize your business. Even if you plan on keeping your enterprise geared toward the Internet, it is a good idea to find out what the requirements are for a business license. Starting out with a sole proprietorship is a good starting point since many wholesalers and manufacturers look to businesses that have taken steps to legitimize themselves. Trade shows are another great way to make the kind of bulk purchases that will pay off in profits. Often proof of being an established business is a requirement to attend these. Searching the Internet will help you to find the schedules and locations. 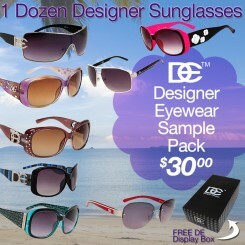 It is critical to find the right market for your sunglasses and target any advertising efforts to what you have found. One good way to do that is with social media in general and Twitter specifically. Searching with keywords like 'popular sunglasses' and a geographic location works well. The tweets that you find will help you to define the audience best suited to buying the sunglasses you have to sell. Finally, make sure to include some display cases in any negotiation if you are buying for a brick and mortar store. These display cases will even work well to display your products if your store is to be solely Internet based.